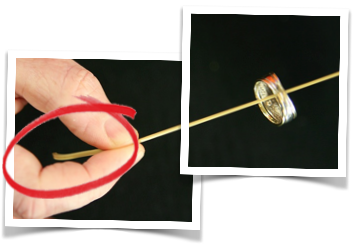 The simple magic trick with a ring and an elastic band is very effective and so easy to do. 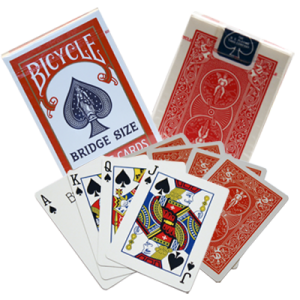 You will have to work harder on the presentation of the trick than on the actual doing of the trick. 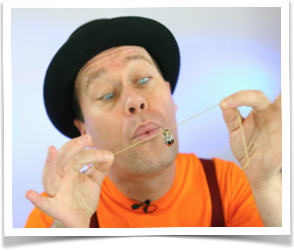 For this simple magic trick, you need to cut an elastic band so that it becomes a length of elastic. Use a standard elastic band, rather than a thick, flat one. Now thread the elastic band through the ring. TIP: You can be borrow a ring from and audience member to add some flair if you want. A thinnish, narrow, round (not flat) wedding band works best. Pinch the ends of the elastic between your forefinger and thumb on both hands. Now it is time for the ‘sneaky move’. Note the extra bit of elastic behind your forefinger and thumb (circled in red). 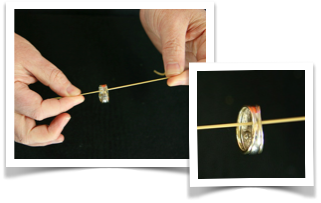 While stretching the elastic band, very slowly release the elastic band and make the ring move up the band as if by magic! Although it looks like the ring is ‘moving up’ the elastic band, what is really happening is the ring sticks to the elastic. When the tension in the band is released the ring actually stays in the same spot on the elastic, but the elastic is ‘shrinking’ back to it’s original size. The illusion is that the ring appears to be moving upwards, defying all laws of gravity! As this is such a simple magic trick to do, work on your presentation to mystify and entertain your audience. I’ve added a ‘blow’ to add some flair! You can now do this simple magic trick. 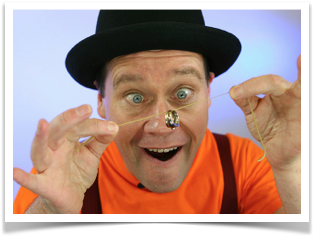 Have fun with the Ring Magic Trick!